A college art student, Alan Parker, is suffering a depressing stage in his life. After nearly committing suicide on his birthday, he learns that his mother is in the hospital from a stroke. Without a vehicle, Alan attempts to hitchhike home; only to encounter a troubled ghost that takes him for the ride of his life. 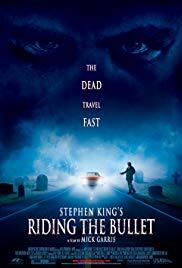 Riding the Bullet is inspired from Stephen King’s short story Everything’s Eventual. The name of the book is a symbol that holds true to the premise of the movie, illustrating how life’s journey can contain moments of sheer terror, such as a death in the family. Even through there are a ton of ridiculous scenes, there are also a ton of situations in the film that represents our deepest fears in real life, leaving the audience with a somber sense of reality. The movie is very much like a trip, no pun intended, since it doesn’t progress like a conventional plot but jumps from location to location instead, often mixing up time frames to keep the viewers on their toes. Mick Garris also uses horrific jump scenes and wildly imaginative ploys to perplex viewers on what is actually occurring. The events in question could be in Alan’s darkly comical, twisted mind or something much more sinister and real. The movie is also strangely quotable, containing humorous dialogues that are spread out through the windingly, interesting story-line. The antagonist, Mr. Arquette does a fine job being the evil ghost, who is the cherry-on-top of the movie. Riding the Bullet is vastly underrated. Watch it with an open mind and you’ll find that the movie’s messages can relate to you in many ways.